I have a thing for mushroom houses. It kind of goes hand in hand with my thing for gnomes. 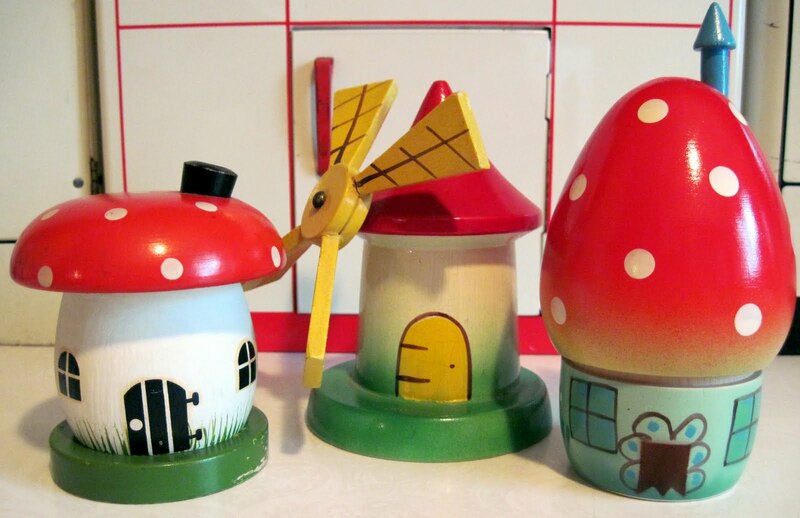 These three pieces were made in different countries at different times, but together, they make a perfectly lovely mushroom village. The littlest house, on the left, is only 3 3/4 inches tall. 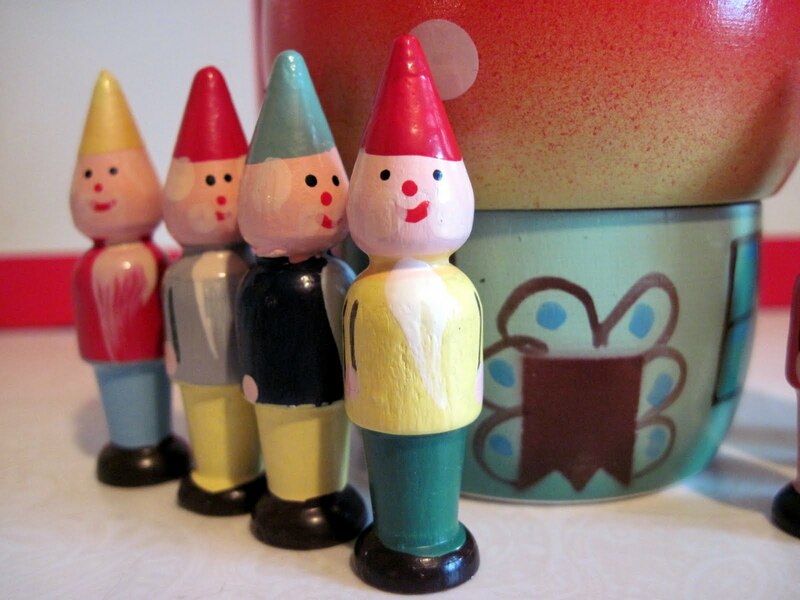 Made in the German Democratic Republic in the 1950s, it's actually a traditional German wooden novelty known as a "smoker". The mushroom lifts off the base, upon which a small cone of incense is set. When lit, the mushroom house is replaced, and the smoke drifts out through the tiny black chimney on the roof. The effect is totally charming, and makes everyone who sees it wish they could hang out in the cozy little mushroom. The windmill in the middle was made in Japan circa the 1960s, and is actually a bank. There's a slot on the top for coins, and a trap door on the bottom to get them out again. The last house is from Poland, and dates to the 1980s. 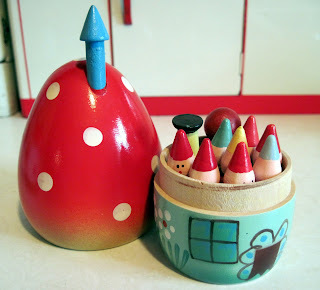 It's a nesting item: the top of the mushroom lifts off, and inside are a set of tiny gnome ninepins and a ball, all made from wood. One unlucky little gnome has to be stored upside down, or they won't all fit. 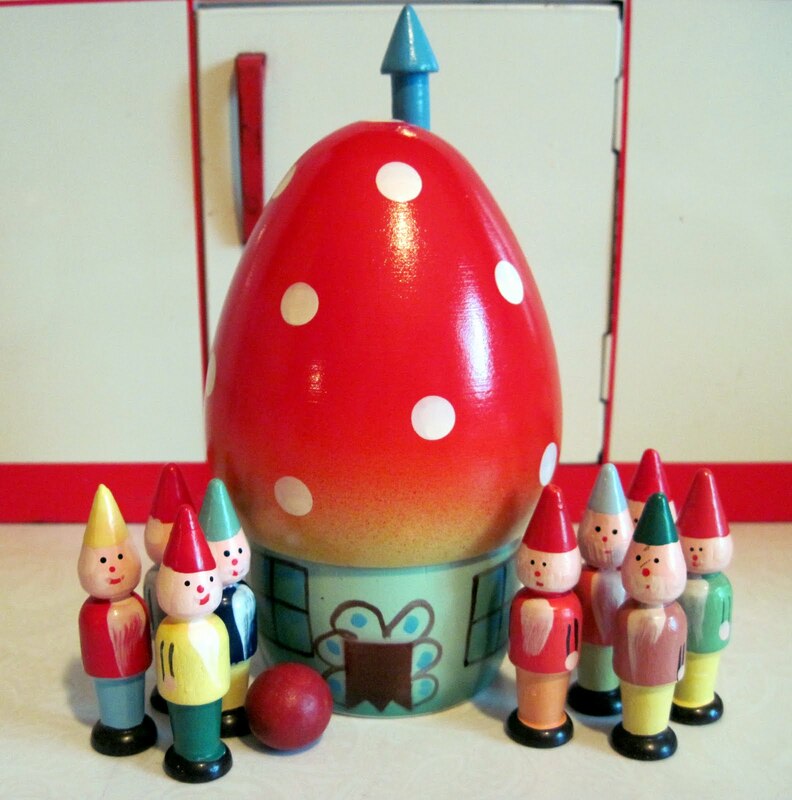 The little gnome ninepins are so super-cute, I can't bear to roll the ball at them. Hi Tracy! I've been looking around the internet for ages now and this is one of the only places I've seen that German mushroom smoker. My dog chewed mine to pieces when she got into my Easter ornaments a while ago (it was a gift from my German grandparents and I am still horrified) and I was wondering if you would ever consider selling yours. If you're interested (or ever become so), I'd love to buy it from you…you can reach me at christinajohannsen@gmail.com if it strikes you sometime! Thanks, and I look forward to hearing back from you!